Expected to be launched by December 2019, MG Motor promises to play a proactive role in educating Indian customers about electric vehicles and charging infrastructure. When launched, it will be the first all-electric SUV to be sold in the country. 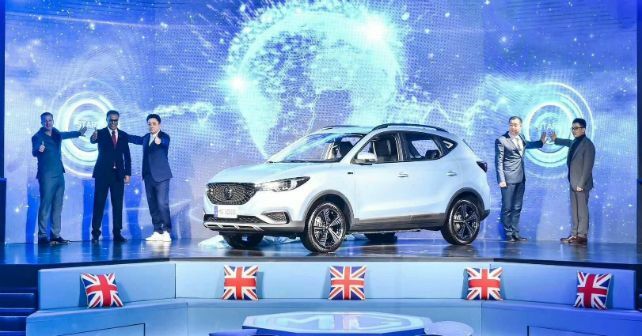 Subsequent to the official unveiling of the Hector, MG Motor has now taken the wraps off its upcoming pure electric SUV – the eZS. When introduced in December 2019, it will become the first all-electric SUV to go on sale in the country. The launch of the eZS is part of MG Motor’s aggressive product strategy for the next two years. Insufficient knowledge and understanding of electric vehicles really make India a difficult market, but MG Motor has aims to take adequate measures to educate the Indian audiences around EV driving range anxiety and charging infrastructure. The all-electric MG eZS’ design is based on the ZS that is sold in the international market already. The car comes with a 150hp battery that allows it a driving range of around 335km. The car will also feature the iSMART Next-Gen, which is set to make its debut with the launch of the Hector in June. This feature is an industry first embedded M2M with Internet Protocol Version 6 (IPV6) ready for 5G. The car will also come with a large touchscreen that allows the driver to control the entire car system with the push of a button. Electric cars have traditionally not done so well in India, but MG Motor is hopeful about the government announcing subsidies and incentives under the recently announced FAME II scheme.